It was designed in 1958 by Gerald Holtom, a professional designer and artist and a graduate of the Royal College of Arts. 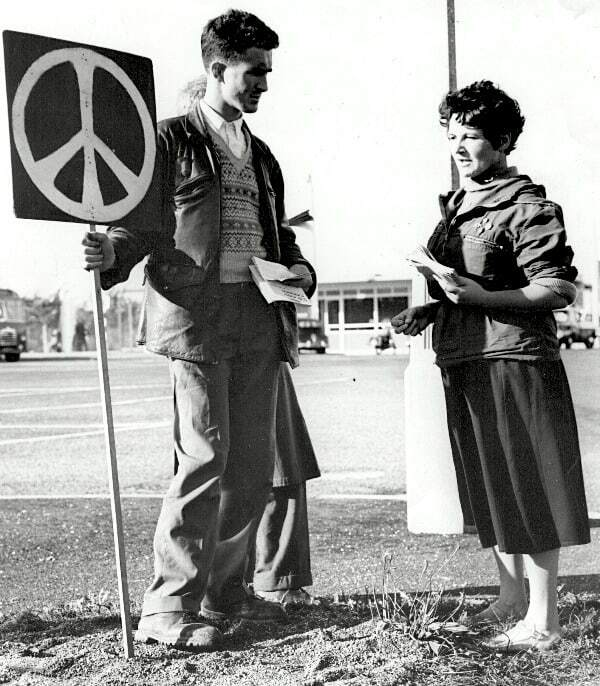 He showed his preliminary sketches to a small group of people in the Peace News office in North London and to the Direct Action Committee Against Nuclear War, one of several smaller organisations that came together to set up CND. 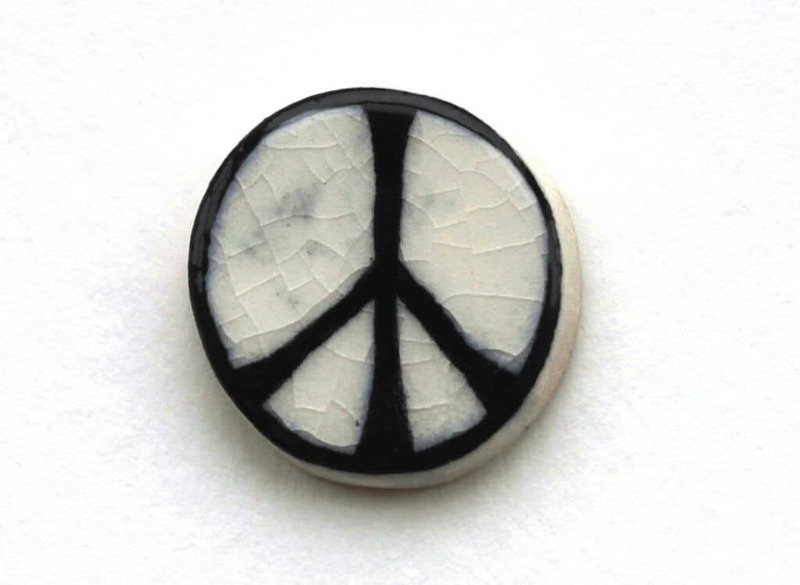 CND still makes badges today, which can be purchased here; all proceeds go towards helping the campaign against nuclear weapons. Gerald Holtom, a conscientious objector who had worked on a farm in Norfolk during the Second World War, explained that the symbol incorporated the semaphore letters N(uclear) and D(isarmament). Eric Austin added his own interpretation of the design: the gesture of despair had long been associated with the death of Man and the circle with the unborn child. Gerald Holtom had originally considered using the Christian cross symbol within a circle as the motif for the march but various priests he had approached with the suggestion were not happy at the idea of using the cross on a protest march. Later, ironically, Christian CND were to use the symbol with the central stroke extended upwards to form the upright of a cross. This adaptation of the design was only one of many subsequently invented by various groups within CND and for specific occasions – with a cross below as a women’s symbol, with a daffodil or a thistle incorporated by CND Cymru and Scottish CND, with little legs for a sponsored walk etc. Whether Gerald Holtom would have approved of some of the more light-hearted versions is open to doubt. There have been claims that the symbol has older, occult or anti-Christian associations. In South Africa, under the apartheid regime, there was an official attempt to ban it. Various far-right and fundamentalist American groups have also spread the idea of Satanic associations or condemned it as a Communist sign. However the origins and the ideas behind the symbol have been clearly described, both in letters and in interviews, by Gerald Holtom. His original, first sketches are now on display as part of the Commonweal Collection in Bradford.